If you don’t know who Kreacher is and why he is so important to the Harry Potter universe, you probably need to go back and reread all of the Harry Potter books. Go ahead, I’ll wait. Kreacher plays a pivotal role when it came to discovering the Horcrux locket that Harry and the gang so desperately needed to destroy to defeat Voldemort. Voldemort himself used Kreacher to hide the locket in the Crystal Cave – and then Voldy left Kreacher there to die (as if you needed more reason to hate He-Who-Must-Not-Be-Named). Fortunately, Kreacher was able to escape from the cave, bring Regulus Black back to replace the real locket with a fake one. Eventually he even helps the gang track down the real locket, which was stolen by Mundungus and ended up in the hands of the only person that’s arguably worse than Voldemort: Dolores Umbridge. ANYWAYS, before I get too far into a Harry Potter tangent (which I tend to do with posts related to the Boy Who Lived), once Kreacher warmed up to Harry and was given the fake locket as a gift, Kreacher actually attempted to bring Grimmauld Place back to its former glory and even made meals for Harry, Ron, and Hermione – though I have a feeling he may have added some of his spit to Hermione’s food…he was raised in a family of pure blood wizards that despised Muggleborn witches and wizards, so I’m sure that prejudice took some extra time to wear off. But I digress. 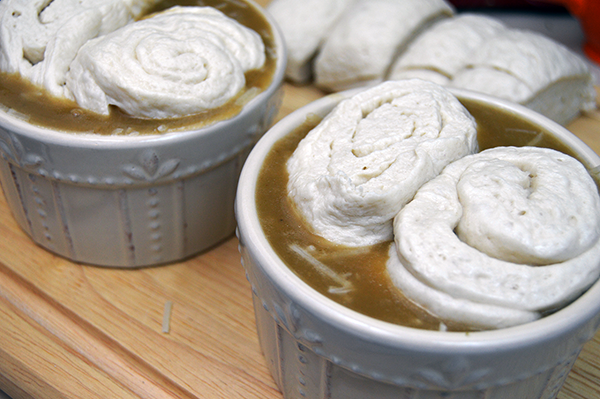 While my version of Kreacher’s French onion soup may be a little far from authentic, I’d like to think he used some sort of elvish magic to create something similar. Start by cutting your onions in half length wise then into slices. 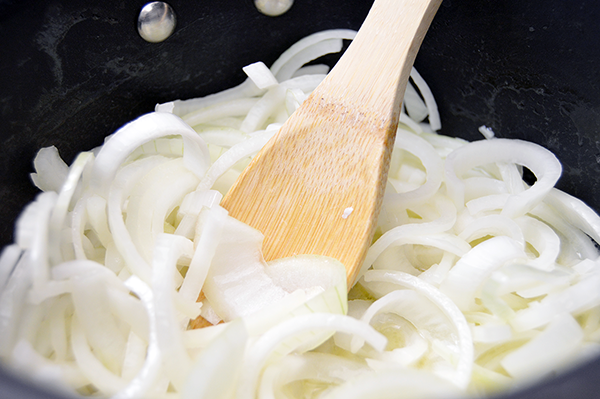 Toss the chopped onion into a sauce pan with some butter, and sauté until the onions are beginning to brown or about 30 minutes. Be sure to stir frequently so you don’t burn the onions! 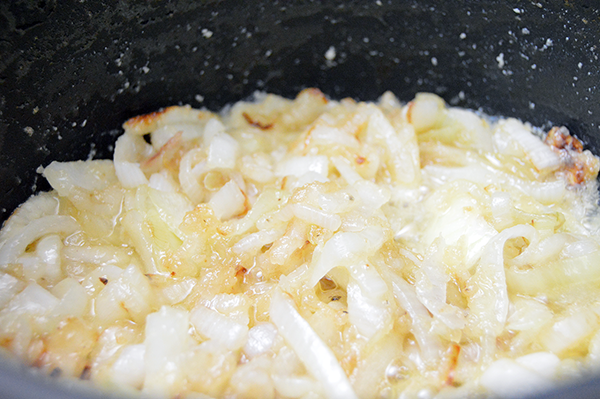 When the onions are beginning to break down, add the remaining butter and a splash of white wine to deglaze the pan. Then add the beef broth and bring the soup to a rolling boil. Preheat the oven and get out some ramekins. 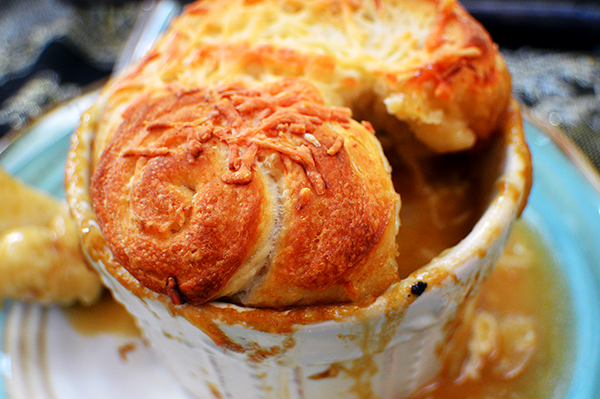 Fill each ramekin about ¾ of the way full with the piping hot soup and cover with a layer of parmesan and gruyere cheeses. Take the pizza dough but do not unroll it! 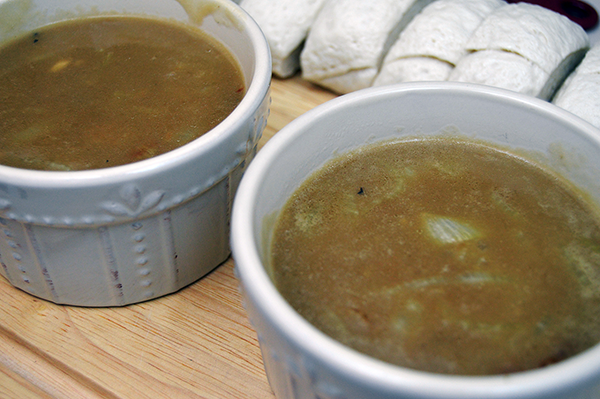 Instead, cut it into 8 even pieces and gently place two of the rolls on the tops of each ramekin filled with soup. Bake in the oven for about 15 minutes, or until the tops of the bread is golden brown. Let the soup cool for a few minutes. I’m sure using a spell such as arresto momentum would help bring the soups temperature down some, but as a Muggle, I’ll just have to wait it out. 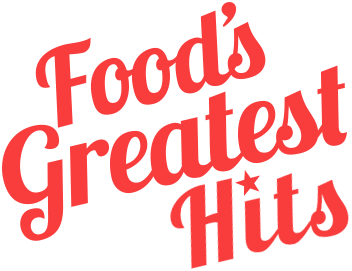 Once the top of the bread has cooled down, serve right away – preferably alongside a flagon of ale. Cut each onion lengthwise then thinly slice. 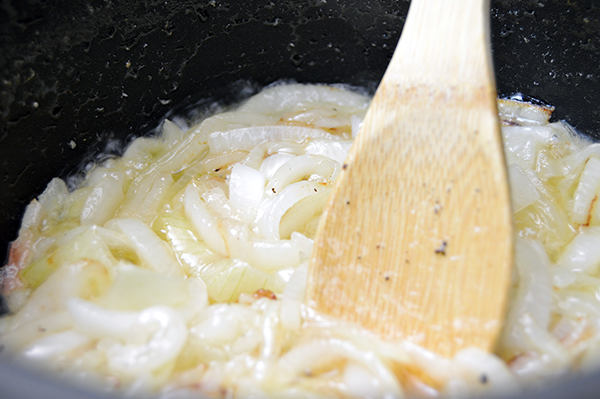 Add the sliced onion to a sauce pan with 2 tablespoons of butter over medium high heat. When the onions begin to brown, turn the heat down to a medium. Sautee the onions until they are browned through, or about 30 minutes. Add the remaining butter to the pan with the onions along with the flour. 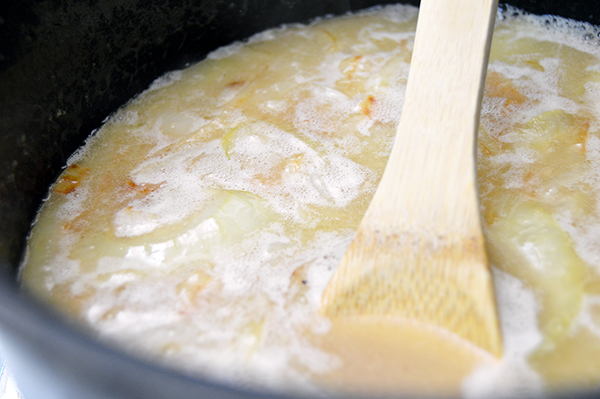 Scrape up any brown bits then use the white wine to deglaze the pan. Finally pour in the beef broth and bring to a boil for 5 minutes before reducing the heat for an additional 5-10 minutes. Preheat the oven to 375°F. Fill ramekins about ¾ full of soup. Cover with cheese. 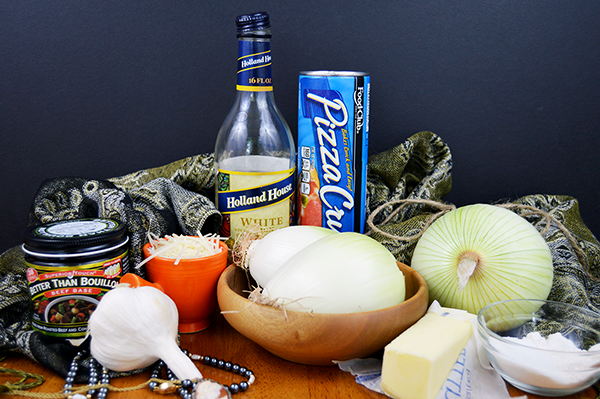 Cut the pizza dough into evenly sized rolls and place two on the top of each ramekin. 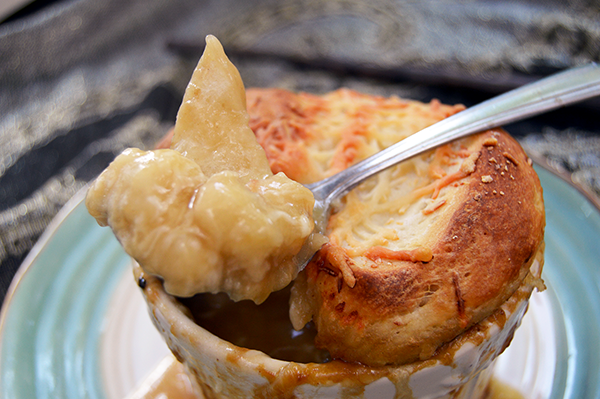 Bake any leftovers as additional dipping bread! Need More Harry Potter Recipes? We'll take the lot! 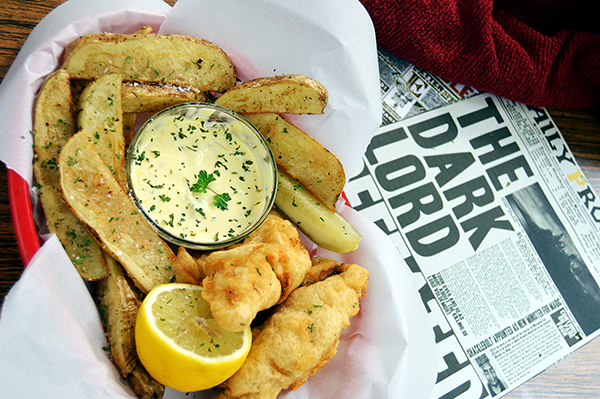 Try this recipe inspired by the Fish & Chips served at the Wonderful Wizarding World of Harry Potter! Enjoy a full Weasley breakfast with these Bangers & Mash inspired by Mrs. Weasley's magical cooking!